Students from Boston Media House celebrated Heritage Month in real style as they got into the spirit of the Heritage Day Fashion Show-Off which was held on 27 September. Students were encouraged to come dressed in the nationality of their choice. There were great prizes up for grabs including the chance to win 2 concert tickets to the much anticipated Rihanna concert, however students really had to show off their creativity not only with their unique outfits but also with their interpretation of their chosen nationality’s language, in order to stand a chance of winning the big prize. Some of the outstanding costumes included Tsonga culture, Zulu, Venda, Xhosa and Tswana cultures. 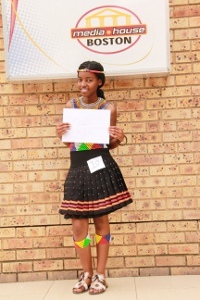 The winner was Zakithi Mabaso who came dressed as a Zulu woman.